A new study conducted of over 1,300 San Francisco Bay Area consumers by Market Authority, Inc. estimates that printed Yellow Pages still accounts for nearly 50% of money spent as a result of a direct local search for a business. The absolute, and surprising, TRUTH about local search in the San Francisco Bay area. The most significant finding of the study is that Baby Boomers and Matures, who control the lion’s share of spending in the local market, turned to the printed directory FIRST 64% of the time. A February 2012 study of 1,328 consumers in the San Francisco Bay Area found that 69% still use (exclusively or at least occasionally) a printed Yellow Pages directory, according to Market Authority, Inc., the leader in directional media print/digital research. Thirty-one percent (31%) of consumers in the San Francisco Bay Area market said they only used the Internet when looking for a local business. The study, conducted between January 15th and February 1st of 2012, polled consumers across all age groups in the following Bay Area markets: Daly City, Fremont, Hayward, Oakland, Palo Alto, San Francisco, San Jose, San Mateo, South San Francisco and Sunnyvale. Logically, younger consumers (those in their 20s and 30s) turned to the Internet far more than older consumers (those in their 50s, 60s and 70s+). Market Authority, Inc. also asked consumers about home Internet access, Smart Phone ownership and opt-in likelihood. Based upon the study, 18% of consumers in the overall San Francisco Bay Area do not have Internet access, while 38% own a Smart Phone. Additionally, nearly 50% of those who reported using printed Yellow Pages to find a local business at least some of the time said that, if it were necessary to opt-in (by phone call) to continue to receive a phonebook, they would NOT go to the trouble to do so. With over 260,000 consumer interviews in 300+ cities worldwide, Market Authority, Inc. provides market research and sales empowerment to directional media companies to assist them in handling the shift of consumer usage from print to digital platforms. 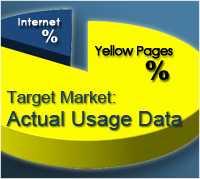 To contact Market Authority, Inc., please call (916) 673-9662, or visit our Website at http://www.MarketAuthority.org. Market Authority, Inc./Digital Marketing, Inc.